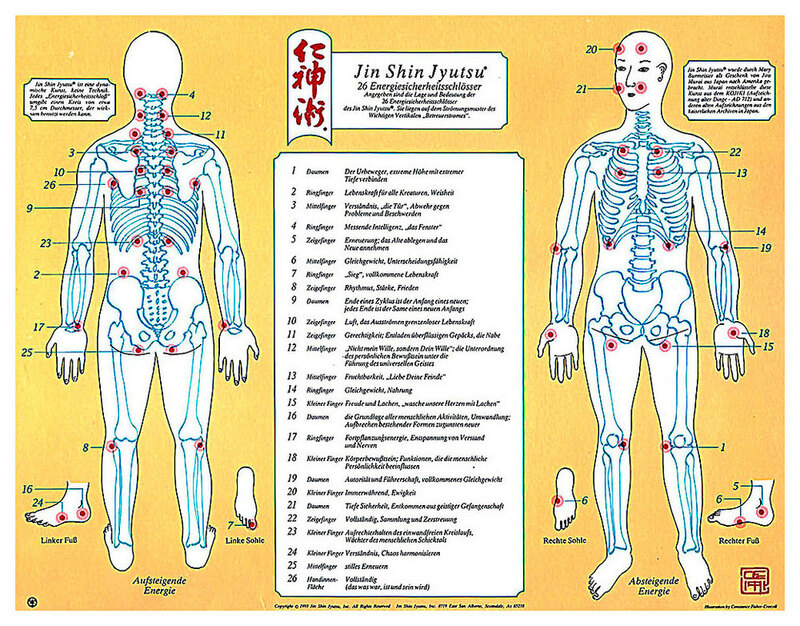 Jin Shin Jyutsu® is a holistic method of healing. It brings life energy into the body, mind and soul and provides balance and harmony. Jin Shin Jyutsu clears energy blockades, releases tension, stimulates self-healing powers and creates the necessary conditions for optimal health and individual well-being. Body, mind and soul are in balance when life energy is able to flow freely. The life energy flows through our body along pathways and is divided into three superordinate harmony flows, twelve organ flows and a number of additional flows. Along the three main flows lie the 26 “safety energy locks” (energy centers) arranged in pairs. They can be contacted and controlled directly by hands. Each organ has its own energy flow with a clearly defined path. Stress, anger, frustration, fear and shock can restrain or even block the energy flow in and to the energy centers. The energy flow circumvents the obstruction and looks for a new path, thus causes a local imbalance. Several such imbalances disturb the entire energy flow with a correspondingly negative impact on vitality and well-being.